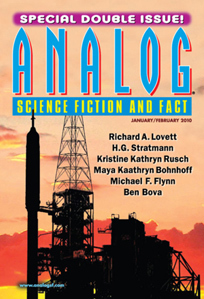 A ‘review’ based on primarily avoiding stories by those regular Analog authors which experience has taught me very rarely provide anything out of the routine scientist fiction provided by the magazine. Richard A. Lovett. Neptune’s Treasure. In a dusty old frontier town a dessicated corpse swings in the breeze, the word ‘shame’ scrawled against the gallows, testament to the folly of the rough justice dispensed by the townsfolks. It’s the corpse of a friendly native American, strung up in the belief that he had lead some desperados to the very member of the town who had befriended him and brought him into the community. Well, obviously it’s not, it’s an alien, strung up in the belief that he had led some other alien desperados to the very member of the town who had befriended him and brought him into the community. Leaving aside the issue about it simply being a well-trodden type of Western trope moved into space, the plot hinges on the alien keeping quiet, when interrogated, about exactly what did happen, as opposed to what the townsfolk believed happened. Michael F. Flynn. On Rickety Thistlewaite. Eric James Stone. Rejiggering the Thingamajig. David L. Clements. A War of Stars. Mayaa Kathryn Bohnhoff. Simple Gifts. H.G. Stratmann. Thus Spake the Aliens. Further adventures of Katerina Savitskaya, who has previously left me unmoved. Kristine Kathryn Rusch. The Possession of Paavo Deshin. A Retrieval Artist story. A young boy has been haunted since infancy by ghosts. When they appear in the flesh, there are several mysteries to be resolved. There are several characters involved, but fairly two-dimensional and routine when compared to KKR’s best work. I limited myself to stories by Resnick and Rusch, who of the authors herein I would have expected to have most likely met with my approval, but even these two didn’t grab. Tad Williams. The Tenth Muse. (The New Space Opera 2).